Perfect for candy connoisseurs, Savour Chocolatier offers a full array of decadent chocolates. Pictured are the sweet shop’s Black Bear Paws and a box of assorted brittles, Maine sea salt caramels, and mendiants. 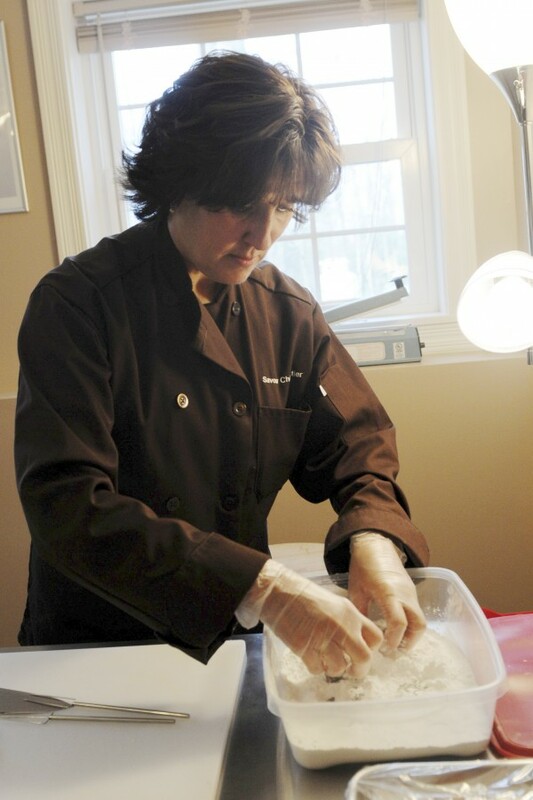 Savour Chocolatier Owner Kim Dagher works on a batch of Bangor Taffy at her businesses kitchen in Veazie. Dagher is a trained chocolatier who studied at the Barry Callebaut Chocolate Academy. 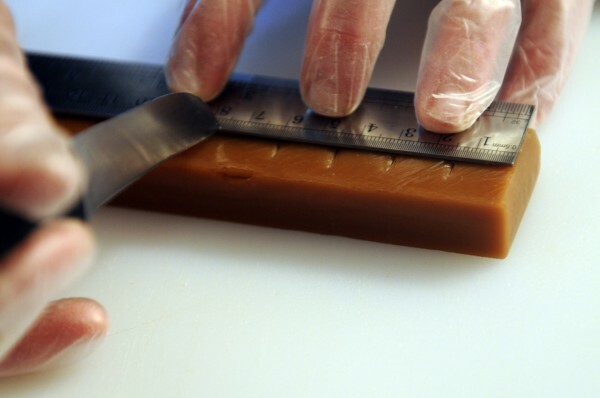 Kim Dagher carefully measures every piece of Bangor Taffy to ensure it has a consistent size and shape. Each batch of taffy (more like a caramel than a sticky taffy) yields about 215 pieces. Len Libby Chocolatier of Maine may claim to have the “original and exclusive” recipe for Bangor Taffy, but one local confectioner begs to differ. That’s because Veazie chocolatier Kimberly Dagher, owner of Savour Chocolatier, believes she has found the predecessor to the famous caramel and confectioners sugar delight. Her recipe, dated 1913 and found in an antique cookbook, deviates from the Len Libby recipe in texture and taste. And according to Dagher, it’s met a fantastic response. The original Bangor Taffy was made by a candymaker from Bangor who convinced the Maine Central Railroad to sell his “taffy” on the Bangor, Portland, and Boston lines. Porters, armed with baskets on their arms were a common sight on the trains hocking the penny taffy. Dagher first found the treat at Len Libby where she tasted it as she prepared to open her own Chocolatier business. And she decided that not only should Bangor have back the taffy that bears its name, but she could make it even more delightful. Savour Chocolatier’s Bangor Taffy is more the consistency of a soft and chewy caramel than a ooey, gooey mess. Each batch she makes yields 215 pieces. Each piece is individually wrapped in cellophane to keep the “taffy” soft and to prevent pieces from sticking together. “I tried making the [original] recipe over and over until I got results that reasonably matched,” Dagher said. Once she got to where she thought the confection matched the memories of Mainers who remembered the original taffy, she had tasters give the final verdict. One of those tasters was Rick Vigue, the owner of Rebecca’s in downtown Bangor. Rebecca’s was one of the first retail locations to carry Dagher’s Maine-made confections. “He popped it in his mouth and from his reaction I knew I had the right recipe,” she said. The confection is the perfect example of what can happen with a little patience and a whole lot of good ingredients. And time. About nine hours worth of time from cooking to cutting. Then another two-and-a-half hours to cut and package the taffy. Dagher’s business officially launched in June 2011 after she finished studying the art of confection-making at Barry Callebaut Chocolate Academy. And her business is located in a very sterile, yet inviting, kitchen in the basement of her home. As the mother of four children — three teenage daughters and a 12-year-old son — being able to work from home has been one of the benefits of not having a storefront. The Bangor Taffy, one of Dagher’s best sellers, is just one of the items she sells. From toffees to caramels, brittles to mendants, and truffles to taffy, Savour Chocolatier offers something for everyone. Other interesting options she offers are pumpkin seed-cranberry brittle, Maine wild blueberry-almond brittle, Maine bear claws, and truffles made using real Maine flavors such as blueberries, maple, and blackberries. The reason? Because it’s best to use real Maine ingredients to please the palate. 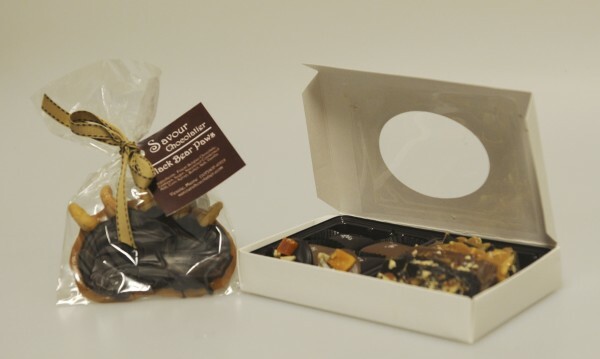 Savour Chocolatier’s goodies can be found at Rebecca’s Gift Shop, Eastern Maine Medical Center Gift Shop, Hollywood Slots Gift Shop, Silver Willow Gallery in Winterport, Sweet Stuff in the Bangor Mall, the University of Maine, and throughout the Bangor area.